The Human Trafficking Project: Federal Prosecution of Illegal Immigrants Soars in U.S.
Federal Prosecution of Illegal Immigrants Soars in U.S. 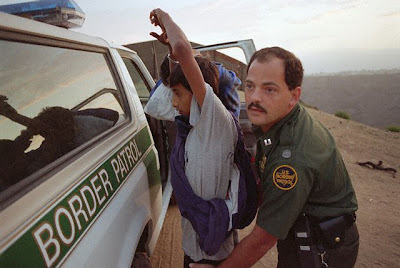 The Bush administration has sharply ratcheted up prosecutions of illegal immigrants along the U.S.-Mexico border in the last year, with increases so dramatic that immigration offenses now account for as much as half the nation's federal criminal caseload. In the widening crackdown, administration officials prosecuted 9,350 illegal immigrants on federal criminal charges in March, up from 3,746 a year ago and an all-time high, according to statistics released Tuesday. Those convicted have received jail sentences averaging about one month. The prosecutions are among the most visible steps in a larger effort that includes work-site raids, increased border patrols and the use of technology and fences. Often controversial, the patchwork of measures represents the administration's response to failed congressional attempts last summer to overhaul federal immigration laws. Administration officials and conservative groups have lauded the increase in prosecutions. But critics say data show illegal immigrants are still trying to enter the country. And some lawyers argue that the push is overwhelming a federal court system with limited resources and higher priorities. Even so, administration officials announced this month that they would be funneling more resources toward the effort, called Operation Streamline. "The results of this criminal prosecution initiative have been striking," said Homeland Security Secretary Michael Chertoff. Chertoff's agency and the Justice Department, which oversee the effort, recently announced a plan to assign 64 attorneys and 35 staff members to prosecutions along the Southwest border. The program began as a pilot around Del Rio, Texas, in 2005 and spread to other areas. Officers and prosecutors participating in it practice "zero tolerance," and jail times can range from two weeks to six months. "The reason this works is because these illegal migrants come to realize that violating the law will not simply send them back to try over again but will require them to actually serve some short period of time in a jail or prison setting, and will brand them as having been violators of the law," Chertoff said. "That has a very significant deterrent impact." The statistical analysis released Tuesday was compiled by Syracuse University's Transactional Records Access Clearinghouse, considered an authoritative source for such figures. It called the increase "highly unusual." Operation Streamline's larger aim is to give the administration another tool to use in its crackdown on illegal immigration, said Susan B. Long, a TRAC co-director and Syracuse University professor. "This is an effort to use the federal criminal justice system in immigration enforcement," Long said. "What it means is that immigration cases are dominating the federal court system these days. The volume of cases is really huge. This is a big deal." Of 16,298 federal criminal prosecutions recorded nationwide in March, immigration cases accounted for more than half, Long said. The next-highest number, 2,674, was for drug offenses, followed by 702 for white-collar crime.